Want to get 3G data pack of 1 GB at just Re. 1 for all Idea Prepaid Users, then you are at right post at right time. Now they had bring the Magic Data Offer. My Idea Offer was giving the free internet data through My Idea app. Now the data of 1 GB at Rs 1 can be claimed through with the recharge of Rs 1. In this you can get data from 100 MB to 1 GB. thats based on your luck. Go for it and claim the offer. My Idea App offers give their prepaid users the opportunity to grab this amazing internet data pack deal at just Re. 1 only. Get upto 1 GB 3G data for 28 days at Re. 1 through My Idea App only. The amount of data pack you get it from this offer will be added to your existing data balance. It means your recent data pack which is not over yet will not be eliminated when you use this offer. You can get minimum of 100 MB 3G data and maximum of 1 GB 3G through this offer. Below are some steps to grab the offer quickly. Hurry up!! 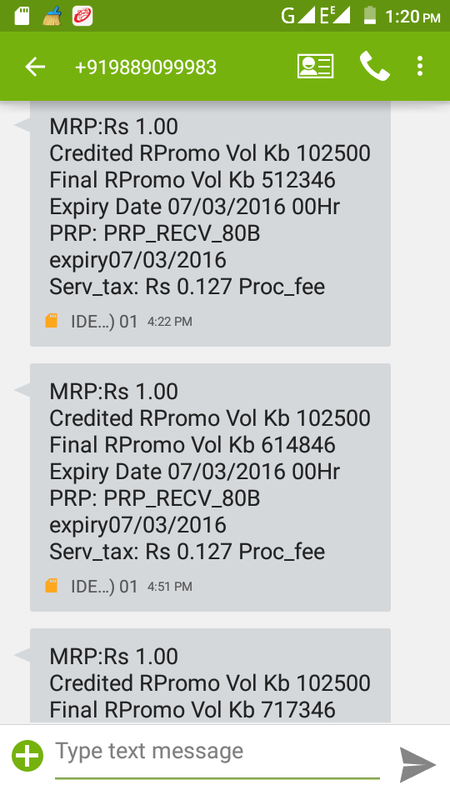 Idea was offering free Missed Call Alert Service for 1 month. These Missed Call Alerts (MCA) will provide you the information for calls received when your phone was not reachable or switched off. We are also provide this offer below. Offer is expired for now and you won’t be able to use this for now. If you activate this offer it will overwrite your existing data pack. 4. Now on the homepage you will see a banner “Get upto 1 GB 3G for Re. 1” click on that banner. 3. After 1 month, the charges will start applying for this service. So just call Idea Customer Care after 1 month and ask him/her to deactivate this service. See your last 1 rs recharge is showing in history or not. If it is showing your last recharge then again make transaction applying code App1 u will again get data. Don’t make recharge till your last recharge not showing in history otherwise your money will deduct but u will not get data. 4. Benefit will be added to your existing data balance. 5. Valid on My Idea App only. 15 Responses to "Idea App offers – Get upto 1 GB 3G data for 28 days at just Rs.1"
How. Use“Get upto 1 GB 3G for Re. 1” click on that banner. had you seen the banner f the same on your app. @admin……idea 1rs pack successfully activate ho gaya h….but 100mb show ni Kar Raha……dekhne k liye kya ussd code Dial krne padenge…..??? Go to app click banner & apply code APP1 & make payment u will get data then wait for 10-20 min & see ur last 1 rs recharge is showing in history or not. If it is showing ur last recharge then again make transaction applying code App1 u will again get data. Dont make recharge till ur last recharge not showing in history otherwise ur money will deduct but u will not get data. Jonomus giveaway kab start kar rahe ho??? We are just waiting for some good offers.